Back in the days, when I started, the GP2 community was alive and large. All seasons were available, carsets were updated right after every GP. Lots of choice, lots of differing quality. Modding was rather simple. 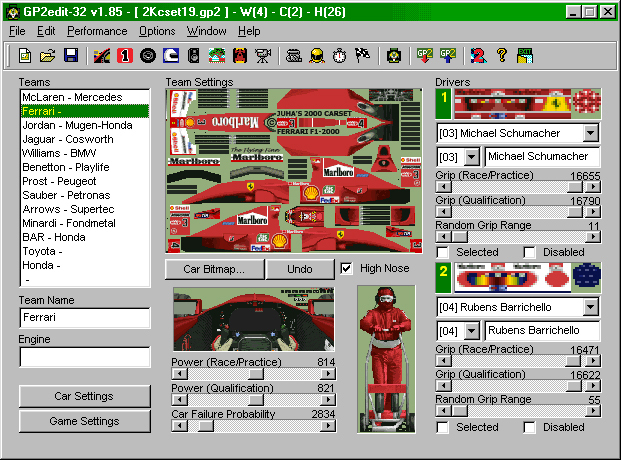 GP2 had two car models, which both shared the same texture layout. Modelling consisted for moving points on the model. You had one texture per car with 256×168 pixels resolution and 256 colors. The simple and blank models the textures made the textures more important, as they were the only means to distinguish – not just by color and logos – but by simulating differences in the car’s shape by clever use of shading and painted details. Barge-Boards and winglets were drawn onto the car, as there was no way to attach them as real 3D objects. Shading defined how low or how high a nose was, or how the shape of the sidepod was supposed to be imagined. He whose painting tools allowed to do anti-aliased painting with so little color was king. 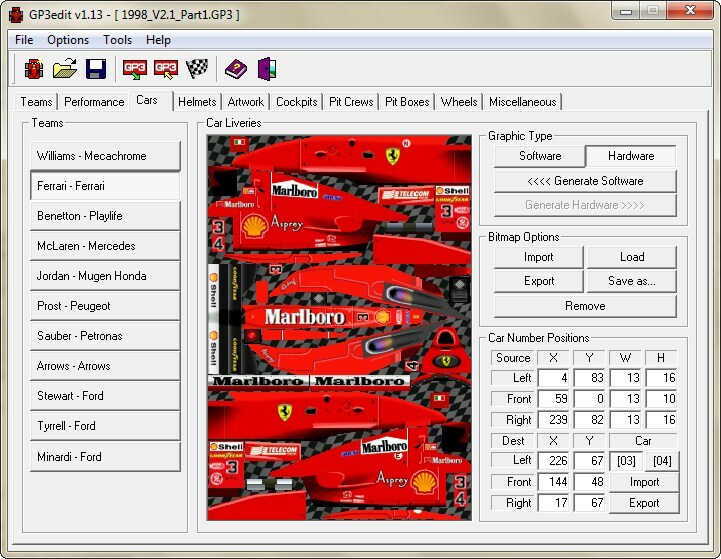 GP2 was never designed to mod, but people reverse engineered the file formats (see inofficial documentation for track editing) Steven Young released his GP2edit, which is an awesome tool for creating carsets including cars, cockpits, performance data and everything you need for a full-season update. Modders could use this tool to create mod packages and have an easy way for racers to install it. As RS2 only included fictional textures, they were smart enough to included a small utility to exchange textures. You had multiple models each simulating one car of the 1997 F1-season, which couldn’t be edited, each with its own mapping and one texture at 256x256px. No way of easy previewing your work, which sucked, as the mapping was horrible and distorting. RS2 was the first Sim inviting Modders, but they did it badly without support. GP3 came with big accolades and it managed to strive on the existing modding community of GP2. 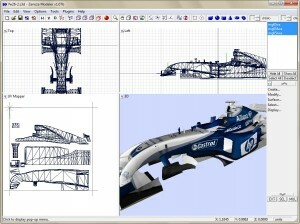 Quickly the tools for GP2 were rewritten and released for GP3. So GP3edit quickly became the natural way to edit GP3, distribute full mods or simple textures. Whereas GP2 had 2 car models, GP3 only had one, which was still as badly to edit as it was for GP2. One model means modders only had to work with one mapping, textures could easily be exchanged between teams. Colors were increased to 24bit, as it is today. This helped to improve the general quality alot, as more people were able to use profesional or semi-profesional graphic tools. Photoshop was still seldom, so became MS Paint. The texture resolution was 256×384. Somebody alone could easily create a full carset within 1-2 months. It was still very common to paint every detail on the car texture and painters never had so much freedom and so much independence in inventing new creative designs and combining them with inventive shapes drawn on the car. Granted it took a lot of imagination and there were big limitations, but sometimes limitations can support creativity, It was alot of hacks, workarounds to create the impression you have the car ingame, that you see on tv. But that’s how we roll, Modders are hackers, too. GP4 was a small revolution in graphics compared to its predecessors, the GP4 engine turned out to be one of the most-scalable racing engines out there. Even today it holds its rights with models and textures a magnitude more detailed than the original content back in the day. (Original textures: 512×512 today Modders use regularly 2048×2048 and up to 4096×4096 have be successfully tried). 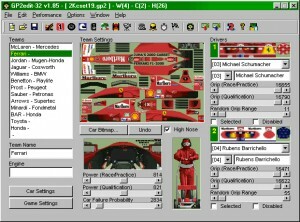 GP4 introduced individual car models for every team (infact with a little hack for every driver). Every model had 3 textures each 512×512 pixels with 32bit colors adding an alpha channel that controls reflections and speculars. With individual UV mappings per car, you weren’t able to switch textures between teams anymore. From here on models and textures were always bound together and could never exist without the other. This ment a very big paradigm shift, because Painters alone very early hit the limits of the GP4 mappings and to continue raising the bar of what Modders can accomplish, the texture designers either had to learn modeling or team up with modelers. Both happened. Tools like the original ZModeler allowed for easy model modification and preview. Painters could lay hands on models and mapping and learn in a reasonable amount of time the basics to continue. Modelers came and used ZModeler to convert their new models from 3D Studio Max and export it to the game. Collaborative work between Modelers and Painters began and spawned increasing quality in terms of accuracy, level of detail and size. From here on out, mappers and painters could always decide on their own on the amount and resolution of textures. Textures still contained details like shading, joint lines bolts and small details, but every large object was modeled on the shape. By now painting meant you had Photoshop and you know how to apply alpha channels to textures to regulate the reflectiveness of the car. You immidiately recognize novice painters by their shiny cars. Many modelers began to release templates for the cars for leagues and fictional cars. Having a constant game for 10 years has it’s advantages, a rich collection of tools and utilities has developed, that bridges some of the worst obstacles the game throws in the Modders ways. At this point I joined CTDP as working alone become more and more difficult and as Painter you’d need modelers you’d like to work with and trust their quality. F1C was simpler than GP4, because its architecture was more open and Modders did not have to reengineer alot as many formats were plain text files or common texture formats. It was easy to mod, because of a good seperation of concerns. It became easy to put cars ingame and quick to work in parallel, so Modders formed teams like CTDP, developed to organize and not only release single-cars, but full-season mods. It was also easy to create cars for GP4 and F1C and release them at the same time. The textures did not have a reflection map, just plain diffuse maps plus a few shader effects. Originally the textures per car were 1x1024x1024 and 1x512x256, but over the years this changed to usually 3x1024x1024 or 1x 2048*2048 per car (we hit the upper limit of the engine with F1-2005). Skins and track liveries were optional, possible to do, but not comfortable. ZModeler was still the 3D utility of choice to export the game and due to its limited capability, this was easy enough for everyone to learn. With rFactor1 came many changes to the workflow of Modders and the relationship of the Painter to the Modeler. The latter getting richer tools like 3D Studio Max, which gave so many more opportunities for advanced and experienced modelers. The bar for novice modelers was raised alot and many couldn’t take it, including myself. We talked about this frequently at CTDP and it gave us alot of headaches, because it was getting harder to recruit people for team. We discussed the more complex workflow required back in 2009.
rFactor increased the paradigm shift. First Painters needed help to create cars, now they are loosing control over the final product not being able to do changes to the cars themselves.This is one step in the loss of control, but it was fine – again rFactor gave many new possibilities skins and track liveries have become easy to do and easy to spent the extra time and effort. Models have different shaders to choose from and in textures that means the Painter has to deal with new normal maps, reflection maps, specular maps. So for every texture on the car you create 5 maps by now. You need to know about the DDS-texture format and how to save your texture properly for the game. The tools were mostly only available for Photoshop on Windows. Combine this with multiple texture per car and multiple skins per team, you really get a huge amount of complexity. Until 2005 it was common to draw all shading on the car manually. You need shading to improve the contrast of dynamic shading on the car. Also the engine could not do on-car-shading, so this had to be done manually. In 2006 the technique of baking rendered shadows on the car became wide-spread. Painters did not need to paint it themselves any more and just applied the baked shadows to the texture. The job discription changed over the years. Painters have become composers of designs, colors, lines and logos and the composition of effects. rFactor2 is the new upcoming platform for Modders and a new generation in terms of Modding. Changes like packaging have potential to change the dynamic of a community. In terms of painting the loss of control is continuing as shaders become the defining factor for nice ingame surfaces. He who controls the shaders controls the look and Painters are support with their work. Multilayer support and possibly Ambient occlusion(SSAO) in shaders are just two – granted cool – additions that may once again increase quality, but also require new expertise by the Painters. The fields and skills painters are required to have, changed a lot. Technical textures, environmental textures become more important and achieving photo-realistic textures is not something that is learned over night. Also painters have different strengths: might as I try, I can’t do good track textures, I’m only good with car liveries. It’s different techniques, but this is where future painters need to shine and where good people are needed today. Modding changed alot in the past 15 years. It has become more professional and it’s not supposed to stop changing. But it is worth to stop for a moment, look back, see how far we have come, look around how many other Modders are still with us, see how newcomers struggle and realize how many we have left behind over the years. Modding is no business and it’s not supposed to be. But for a hobby it’ll reach a point where very few people can support it unless we think about how we can decrease complexity and make it easier again by good conventions, awesome tools/software and great documentation. We hope for 15 more from you guys, i’m a but dusapoitend that the adult life stole me the time to learn to do decent textures for the GP series. I miss the old days, now you need to be a top notch designer and modeler to do anything decent. I started paiting that time… but after Grand Prix series I started again painting only with pCARS. I note that you don’t give details about RF2 texture size and kind… is the beta not opened enough to already know this ? I didn’t mention many details for rFactor2, because we are just getting into this and IFM-2009 is our testbed to see what good conventions are. The general suggestion is to continue with the texture sizes of rf1. What could be increased is the size of the normalmap, but actually we could reduce it, since we have all joint lines modeled on the car. 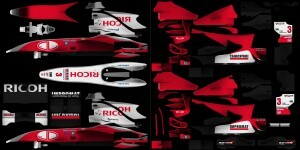 Compared to our F1-2006 mod, we have the same amount of pixels per car, but the balance is different. Where the livery in 2006 got 3x2048x2048, it now gets 2x2048x2048. However we spent more pixels on the technical textures this time scaling them up. However this is still preliminary and subject to change once we get into performance optimization. Where is the editor (Paintkit) of Nascar Racing? Good reading, and congratulations on the anniversary. It was interesting to see some carsets I made back in the GP2 golden era of 97-99 are still online at grandprix2.de! I’m fine and still working on my tools, from time to time. Thanks for the RF2 details, I’m not at all in RF anyway but was curious to know details. To say the truth, I’m in Project CARS, as a player though, and I don’t know if it will be moddable more than via car templates released by developers (some kind of “première”). Finally our trajectory had been very close until you decided to move to F1C then rfactor when I stayed sticked at GP4. However only the trajectory can be compared.